DeathNote is a Mystery/Psychological anime based on the manga by Tsugumi Ohba and published by Shueisha. The 37 episode anime comes from Madhouse, originally airing from October 2006 to June 2007. Viz Media holds rights to both the anime and manga series. Two light novels, two games, and two live-action film adaptations were also created between 2006 and 2009. The art and animation stye of DeathNote is simply stunning! Mixing a gothic art style with minimal animation and a very over the top soundtrack, this series is just a real visual pleasure that you can watch over and over again. The downside of all this, however, is the small amount of animation because almost the entirety of DeathNote is dialogue. From people talking to each other to the many, MANY monologues, all you hear is talk, talk, talk, talk, talk. When the animation does comes into play, Studio Madhouse certainly took it over the top! I never knew writing in a notebook would be so awesome! That and eating chips. The main plot of the story is a fun one to watch because it's all just mind games. You don’t even care about how Light keeps killing people, or L eating sweets, because your attention is drawn to the logic battle between these two characters. For the first half of the series, you are just sucked into the battle Light and L conduct with each other and you pretty much have to force yourself away from the screen in order to do simple tasks like eat, sleep, and use the bathroom... Okay, I’m over exaggerating a bit, but you get my point. In the second half, when things are turned over to Near and Mello, the story kind of dies, and at this point you’re wondering when something really awesome will happen, so it ends up taking away what makes the series truly amazing, but not by a staggering amount. It just wouldn’t have made a difference adding in Near and Mello and just stuck with L. The mind games are still there, but you’re mostly focused on Light more then anything for the rest of the series. However, the last episode truly makes up for it, and it certainly will leave the viewer satisfied. You may even wanna watch the last episode again and again because of how well done it is! The characters of DeathNote have no development to them what so ever. Now, usually, I harp on an anime for lack of developed characters, however I can’t really do that here. You can tell that Madhouse wanted to focus on the story and the art style instead of fully developed characters, but is the series terrible because of it? Not in the least. Outside of Light and L, the characters are one note, leaving all your attention on what really matters, the mind games. Both the Japanese and English languages were done very well, so when picking a version to watch, it will have to be left up to personal preference. Even though both are well done, there are a couple pieces to point out for each one. If you’re looking for a very well done portrayal of L, then look no further then the Dub. Alessandro Juliani (Ranma 1/2) was the perfect choice for the role. He adds the right amount of intelligence and, sometimes, childish behavior L gives off. To be honest, if you watch the English version it should be for L because he carries the show partially on his own. Kappei Yanaguchi is just as well done in the Japanese version, but Juliani is far more superior. Now Light is a bit of a different case. Both versions are well done too, however, if you want to find a better consistent version of Light then I suggest Mamoru Miyano and the Japanese version. Even though Brad Swaile (Mobile Suit Gundam) did a very good take of Light, it took quite a few episodes before it seemed more natural sounding. After that, Swaile even ends up on the same level as Miyano. 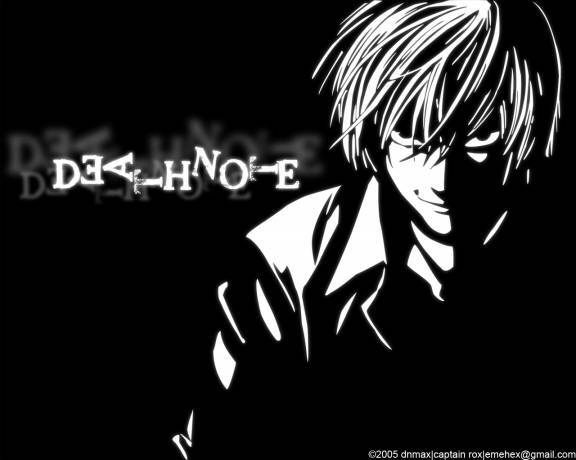 Some other voice actors for DeathNote include: Shannon Chan-Kent as Misa Amane, Brian Drummond as Ryuk, Chris Britton as Chief Yagami, Vincent Tong as Touta Matsuda, French Tickner as Watari, and Kirby Morrow as Teru Mikami. Now, I mentioned this in my “Memorable Anime Villains” with Hasteaguy back in August, but I feel it’s worth mentioning again. A lot of people get into the debate as to whether Light was doing the right thing and is just an anti-hero rather then the villain of the series. The most used claim is that he was mislead by the DeathNote. However, like I’ve previously said, you have to have bad intentions to begin with if you want to create a new world where you can be God. Plus, declaring that you’ll be God in the first episode doesn’t show that you have the best intentions from the start. Sorry, Kira clan, but Light is in no way a hero. But he does make for a fun character to watch. At the end of the day, DeathNote is a visual stunner that takes simple things like writing in a notebook and takes it over the top. If you’re not bothered but constant dialogue or very underdeveloped characters, and LOVE mystery and psychological anime then I highly, highly, HIGHLY recommend this anime. Admittedly, I was a bit hesitant about watching DeathNote, and didn’t see why people are such huge fans of the series, but after watching this a few times now I can understand why. why.... why did he have to die..:((..